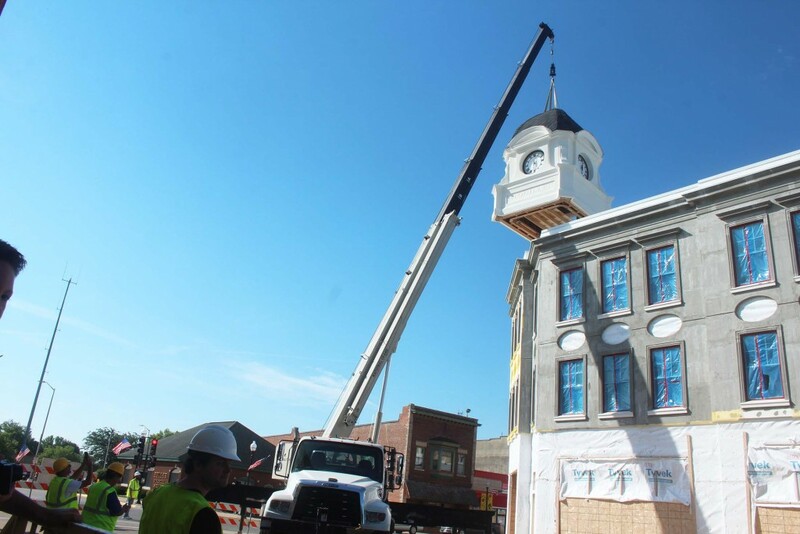 Crews prepare to raise the McQuillen Place clock tower early Thursday morning. 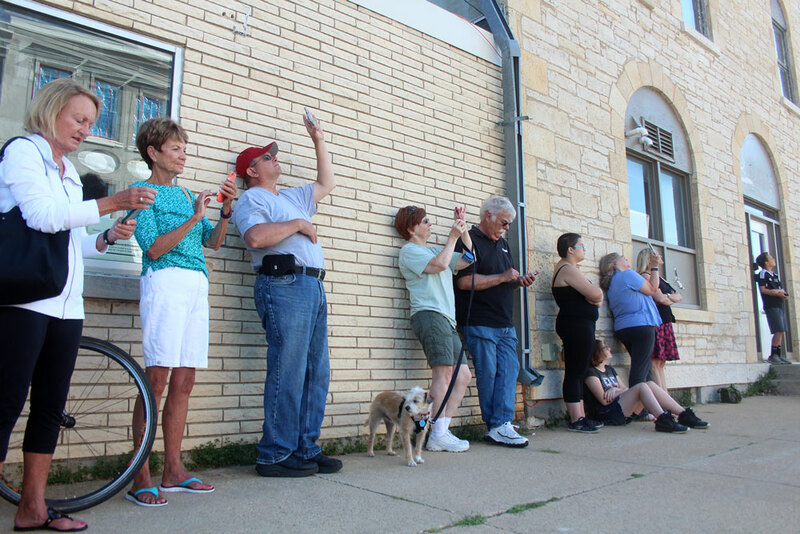 Community members take pictures as they watch construction crews prepare to raise McQuillen Place's clock tower. 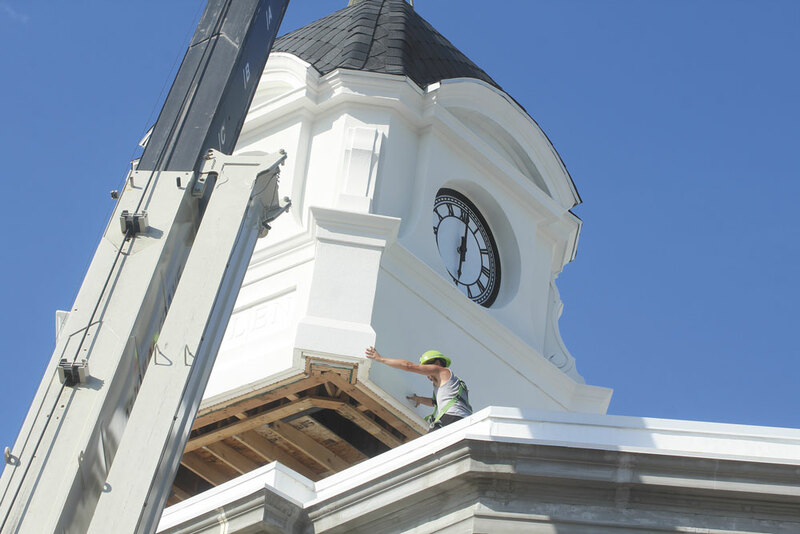 A crew member positions the clock tower into place Thursday morning. The main raising was finished by 9:30 a.m. 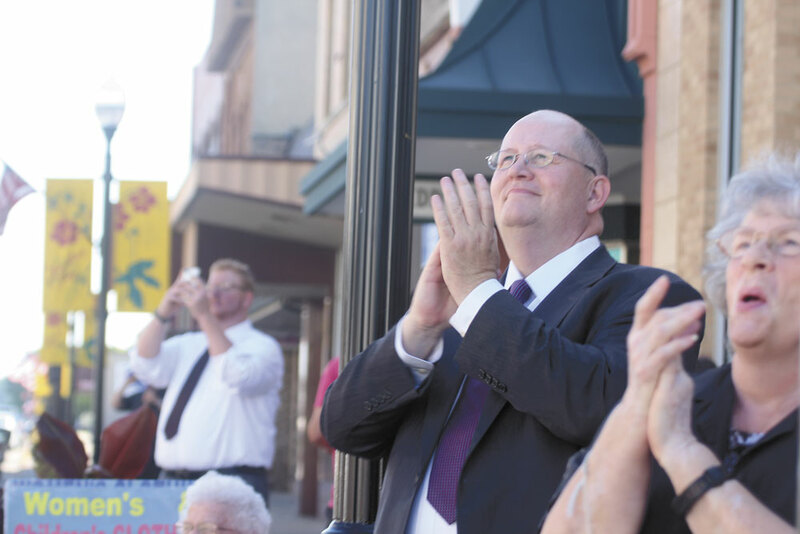 Developer Charley Thomson applauds with some members of the crowd as the McQuillen Place clock tower is settled into place. 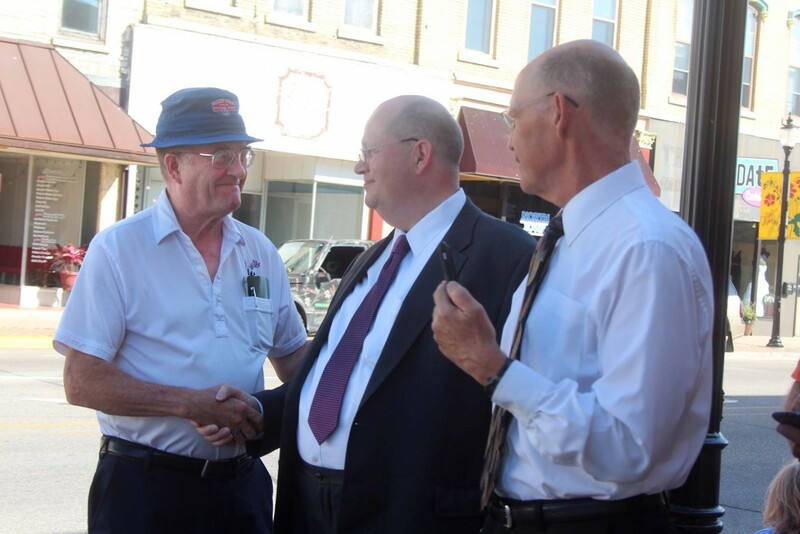 Charles City Council member Jerry Joerger congratulates developer Charley Thomson at the end of the clock's raising. Community members linger on the corner of Main and Clark streets Thursday morning. Sitting high above Main Street, overlooking daily life in Charles City, a weathervane now balances in the wind. The weathervane depicts a rushing traveling salesman and was designed by Robert Milton Thomson, a traveling salesman himself, for his home in 1935. 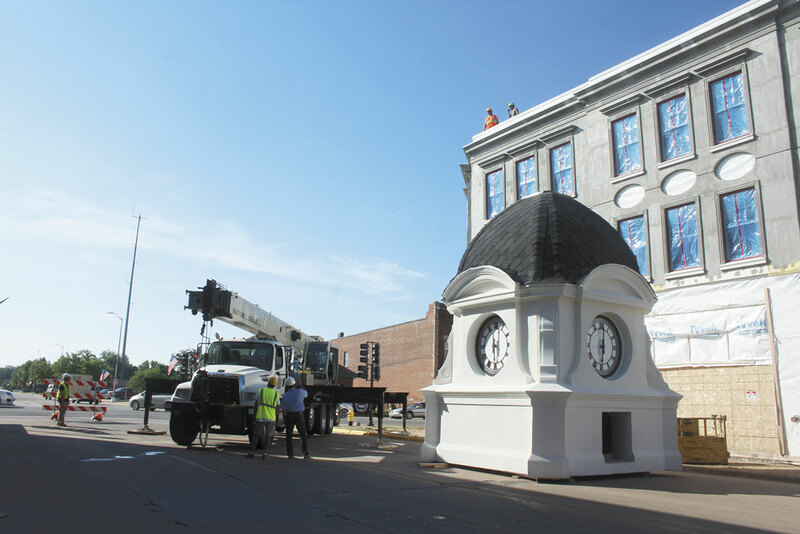 On Thursday morning, an enlarged reproduction of the weathervane topped off the clock tower of McQuillen Place, which was raised by construction crews in front of an impromptu community audience. 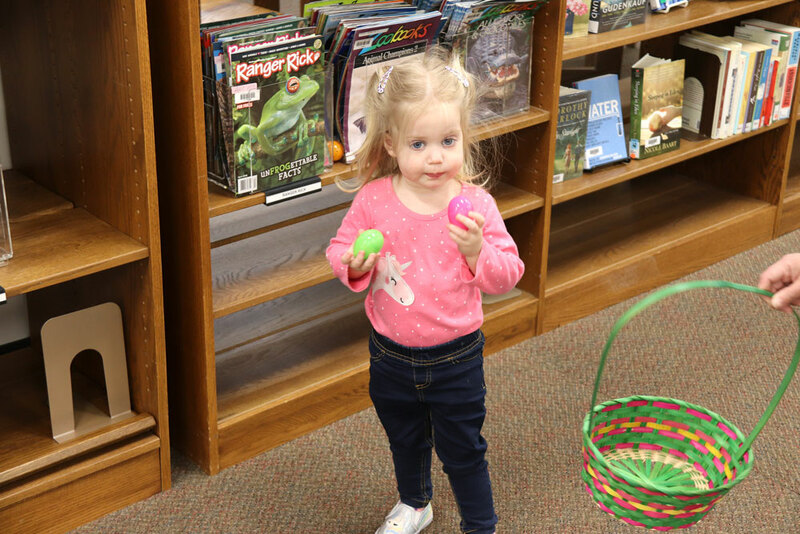 “It was great to see it go up exactly as anticipated. It was very gratifying,” said developer Charley Thomson, grandson of Robert Milton Thomson. It is traditional when topping out a structure for builders to include a branch from a species of fir tree, “to show that nothing is taller than God,” Thomson said. In this case the species of fir tree was, of course, cedar. 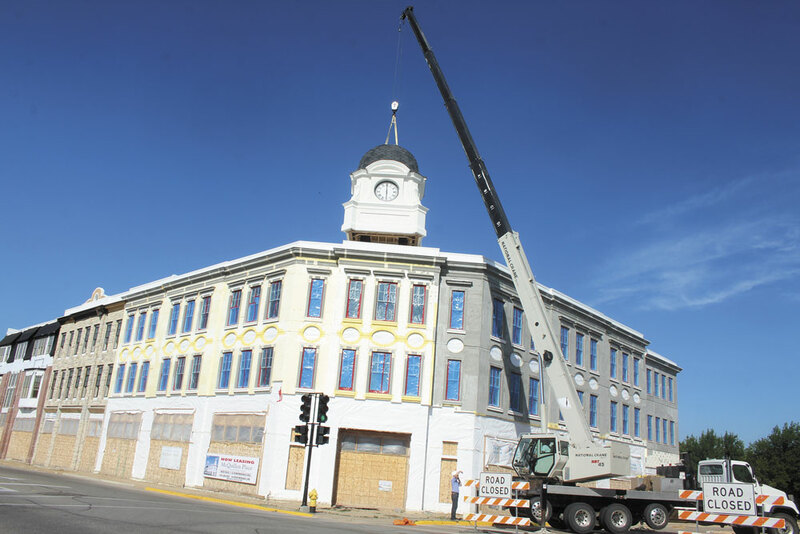 While there is still progress to be made on McQuillen Place, the clock tower’s raising establishes the new outline at 123 Main Street. 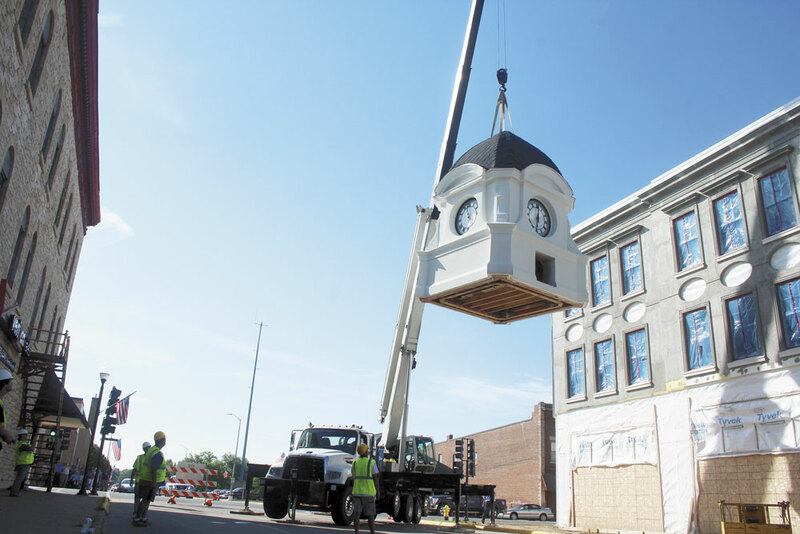 Crews closed Clark Street between Main and Jackson streets starting at 7 a.m., and had the clock tower installed on the corner by 9:40 a.m. 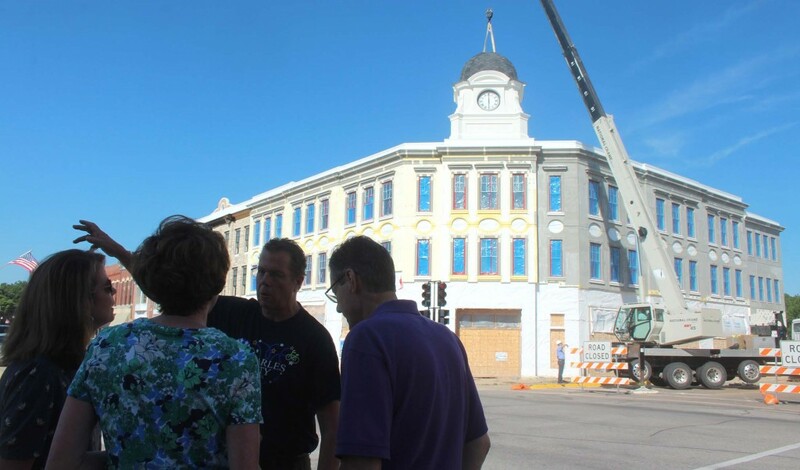 The audience applauded as crews settled the clock in place on top of the building. The rest of the morning was spent installing the finial atop the tower, aligning the weathervane and finishing up with fastenings and other final details. The tower was heavier than crews anticipated — weighing in at 11,397 pounds, according to the crane’s meter, — and had countless hours of work put into the design before crews ever hooked it to a crane, Thomson said. 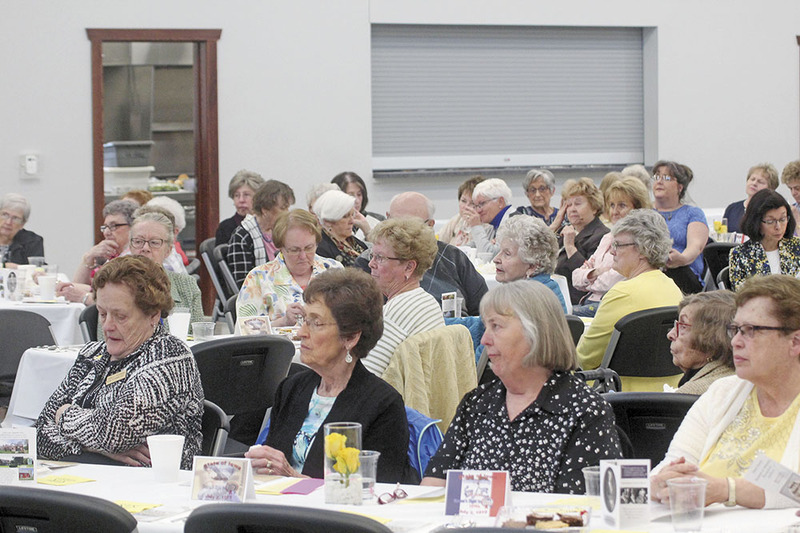 Architects James Gray and Seth Holmen worked on more than 100 different configurations for a design that would fit the space and the community. 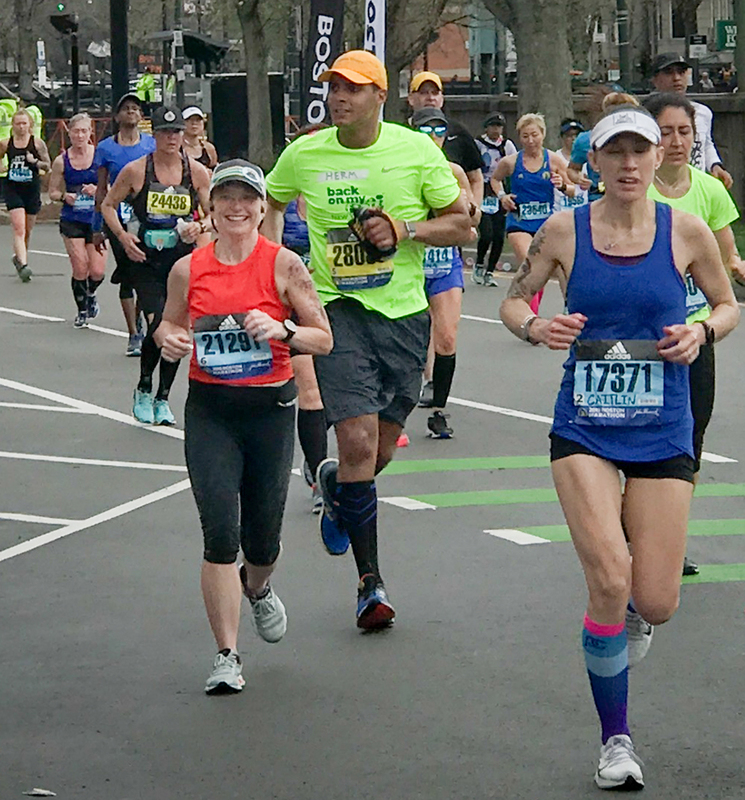 The crane operator reported no stress fractures within the structure at the end of the process — a surprise, Thomson said, after the clock tower was raised into place by a cable hooked into the center of the tower. “It’s probably because the guys who built it used more materials than had originally been anticipated. 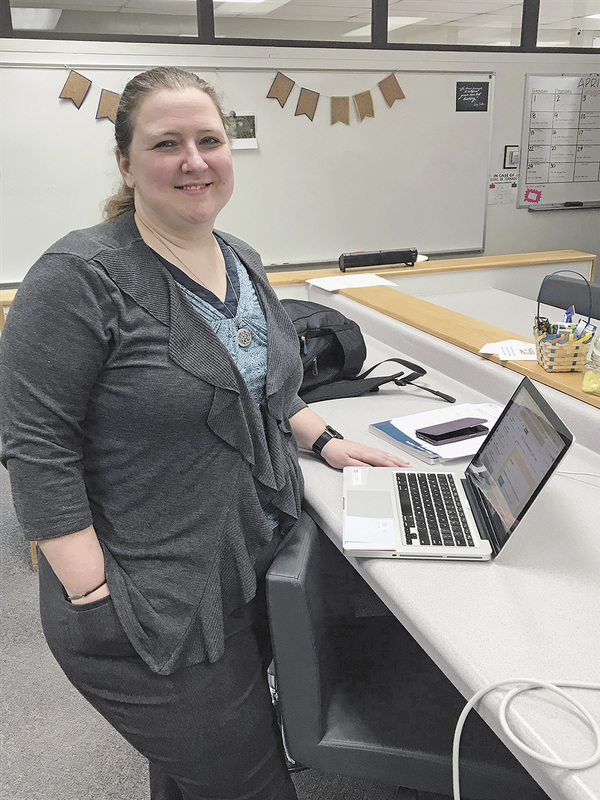 That’s why it was a little heavier than projected — it’s just a more solid structure,” Thomson said. The electric clock itself will be started “as quickly as possible,” he said, but workers must first wire the clock down to a third floor power and control room. 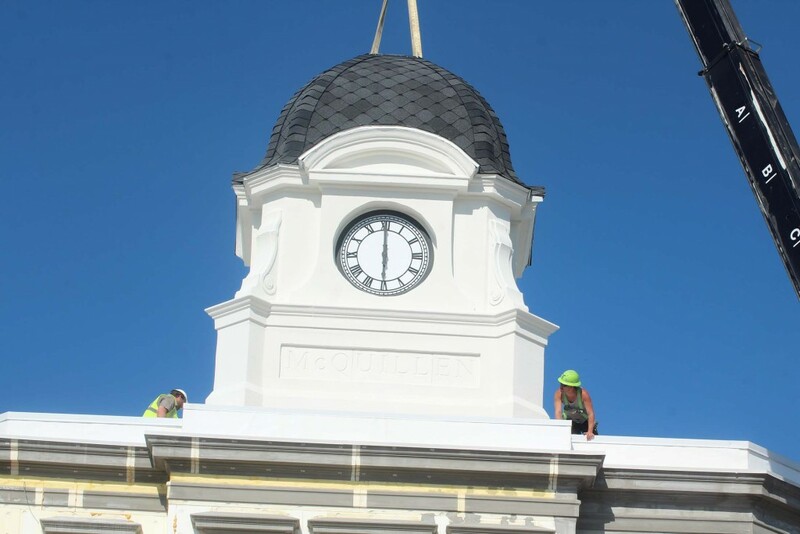 There’s no completion date for when the clock will be turned on. Inside the top residential floors of McQuillen Place, 12 apartments are nearly completed, with appliances and final finishes being installed. 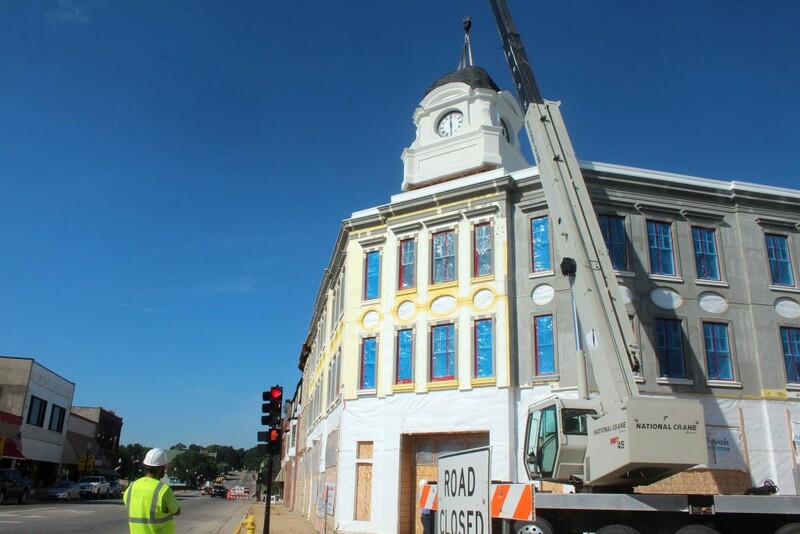 Drywalling and painting is continuing in other units, and the development is waiting on a certificate of occupancy before drawing up lease agreements, Thomson said. 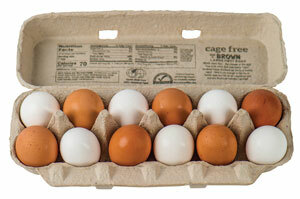 As of July, poultry producer Simply Essentials is the only confirmed business to lease space on the first floor. The business will use the location as corporate and training office space. Thomson would not comment on other lease discussions, but said the construction crew will continue finishing the building’s exterior and let future occupants make decisions on wall space and layout. “We won’t finish walls or put in bathrooms if we don’t know where the tenant wants them,” Thomson said. He said he would like to have the sidewalk poured in front of McQuillen Place by the time RAGBRAI riders roll into Charles City on July 26. 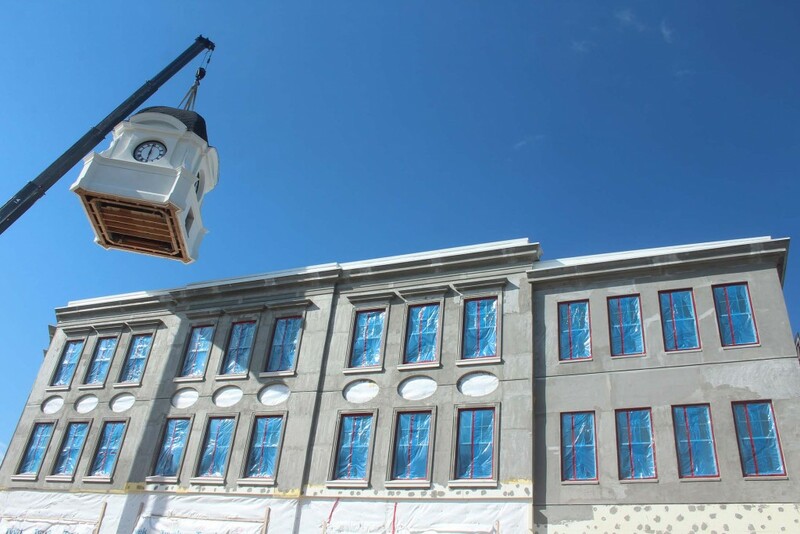 To accomplish that, crews must finish most of the Main Street facade work on the second and third floors before the concrete is poured. “All of that is hard to anticipate. A lot of things have to happen before the job is complete,” Thomson said. 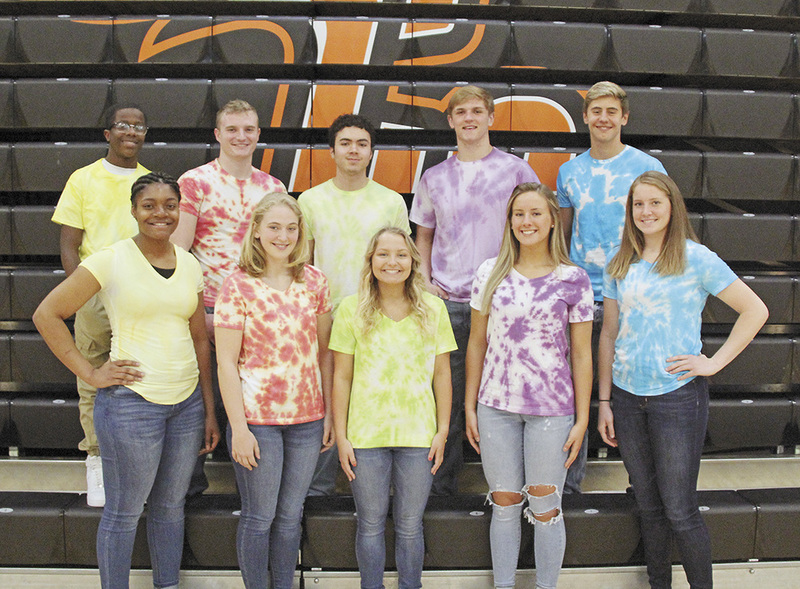 — Charles City Press Editor Bob Steenson contributed to this report.